Whew. This 9-word recipe title may win the award for the longest I’ve published so far. Still, whatever it’s called, I loved this healthier crispy baked chicken! I have honestly always made my “crispy” chicken recipes oven-baked and not fried. (I don’t even own a deep-fryer!) But this time I decided to sub in some wheat germ alongside my beloved Panko to give the breading a little extra healthier kick, and it was fantastic!! 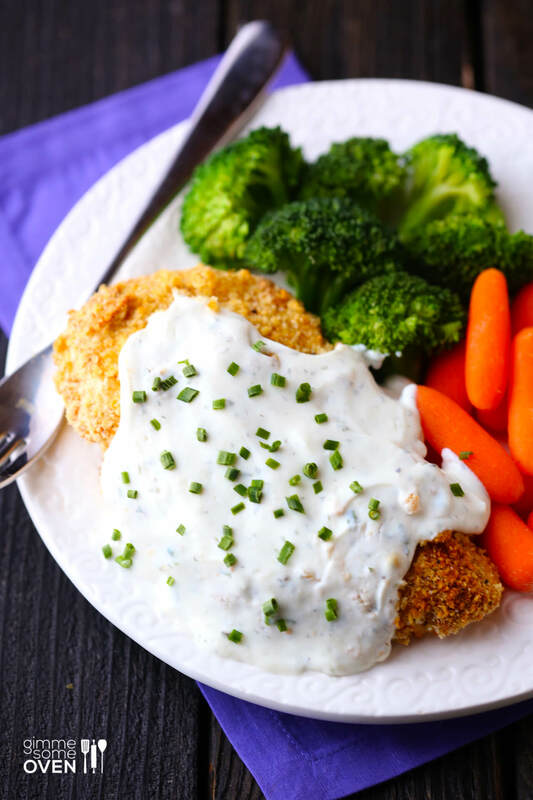 As soon as the crispy chicken emerged from the oven, I topped it with some of my Skinny Greek Yogurt Ranch Dip, which melted on top to form the perfect creamy sauce. It all felt wonderfully decadent, but I loved knowing that there were all sorts of healthier twists hidden in there. 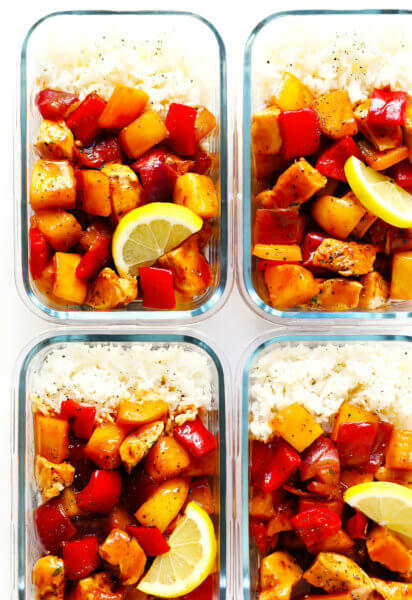 What are your favorite tips for healthier chicken recipes? 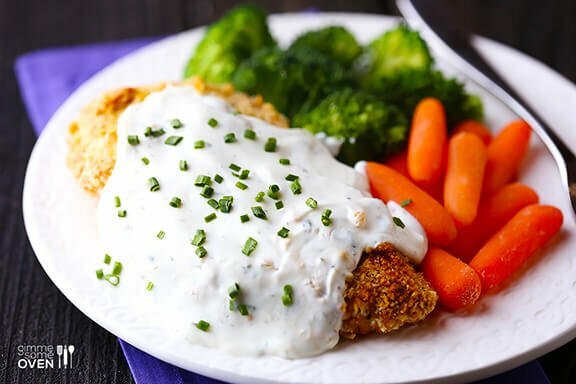 Tender, crispy, flavorful chicken is topped with a lighter ranch sauce. Preheat oven to 400° F. Prepare a baking dish (with sides) with cooking spray. In another medium bowl, mix together panko, Kretschmer wheat germ, parmesan, garlic powder, onion powder, salt and cayenne. Dip 1 piece of chicken into flour until completely covered, shaking off any excess. Then dip into egg mixture, and then crumb mixture, making sure to press crumbs onto chicken before placing onto prepared cookie sheet. Repeat with the second chicken breast. 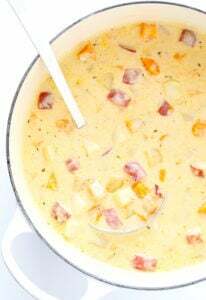 Place in the oven and bake for 10 minutes; flip chicken pieces over and bake for another 5-10 minutes or until chicken is fully cooked and no longer pink inside. Immediately after removing from the oven, top each chicken breast with about 1/3 cup of the Skinny Greek Yogurt Ranch Dip, spreading it so that the entire breast is covered. The dip should thin out as it is warmed. But if you want a thinner sauce, you can also whisk in a tablespoon or two of milk into the dip beforehand to thin. Recipe adapted from My Wheat Germ http://www.mywheatgerm.com/Baked-Chicken-Fingers. This looks incredible Ali!!! And I love that you used Kretschmer Wheat Germ!! I’m on their Health & Wellness Advisory Board and it’s amazing how many (truly) delicious ways there are to use wheat germ! (PS: Do I sound like a wheat germ stalker?? Please advise..) PPS: My 17 month old would devour these. This sounds great! Definitely a recipe to try. Pinning! I love making ranch dressing with greek yogurt. And I love the idea of putting it over baked crispy chicken! ummm yes please. I never thought to use wheat germ with panko! I see me trying this in my near future! I’ve been trying to eat healthier recently and this looks like such a perfect dinner! I love this crispy chicken. The wheat germ is a genius ingredient too. Love it all! That chicken looks positively amazing. I need to find more uses for my jar of wheat germ and this looks like a good start! Oh momma, that looks so good! I have a healthy “fried” chicken recipe and I use light mayo to get the bread crumbs to stay on. Yep! 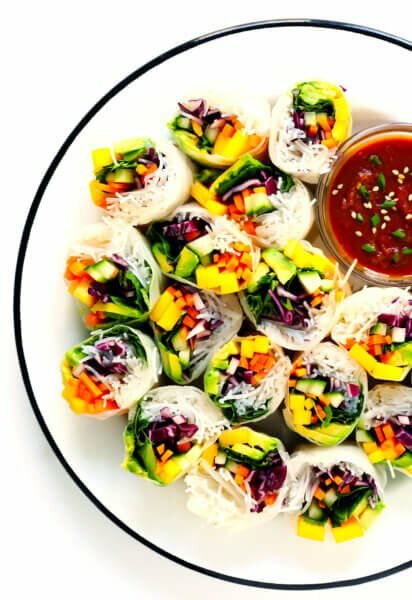 Totally making this for dinner tonight! Thanks, Ali! 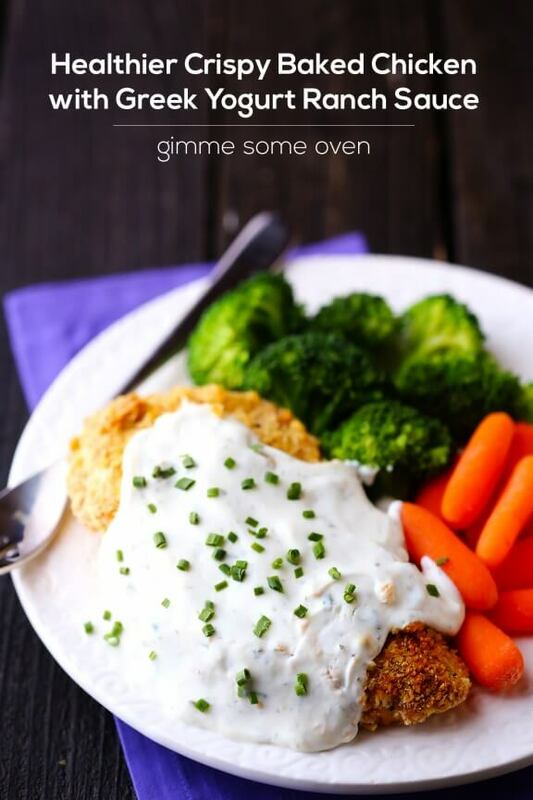 How smart to add the wheat germ to this chicken recipe! I love crispy baked chicken, perfect weeknight dinner! My husband bought a deep fryer about two weeks after I had my daughter and I was trying to get back in to my normal clothes. Needless to say, my wait loss stagnated. But, as for me, I completely prefer a baked crispy chicken. This one looks amazing! Wheat germ is a great addition. You’re so clever! This makes me day because it’s a lightened up version! Chicken should always have sauce. I kinda want to trade places with this chicken :) sauce-blanket wha-what?! No really, I like this lightened version, it means I can have seconds! I actually really love oven baked crispy chicken. Although I’m not sure mind ever looks as crispy as this does. Yum! This is my kind of chicken! and of course that ranch sauce sounds amazing! This chicken looks so perfectly crispy! And the sauce sounds yummy too! Really wish I was having this for dinner tonight! Love this healthier twist on fried chicken, and your yogurt ranch sauce looks great!